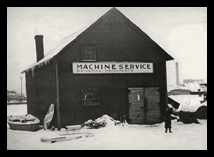 Machine Service, Inc Company History | Edward Fowles, Jayne Anderson, Bill Fowles and Edward Fowles Jr.
Today with over 175 employees serving clients world-wide, MSI continues to respond to customers’ needs and changing technologies. MSI has certainly grown from its humble beginnings, yet many of the key founding elements still remain. Manufacturing precision parts, offering high quality components and providing excellent on-time service will always be MSI’s formula for success.